Head of School Alex Ragone launched AltSchool Union Square with five educators last fall. In this post, he reflects on the experience of working with students, educators, and pedagogy experts to build a strong and supportive middle school culture and an integrated, rigorous student-led program that develops the whole child. AltSchool Union Square serves 5th- through 8th-grade students. Last fall, along with five educators, I started a new middle school in New York City—AltSchool Union Square—with an ambitious goal: to enable each child to reach his or her potential. We approached this monumental task by focusing first on students learning how to learn, with educators playing an essential role in guiding their learning both inside and outside our classrooms. Read more about “learning to learn” skills from AltSchool educator David Rodriguez. Learn more about the Understanding by Design framework. Over the summer, I teamed with Humanities Lead Jaqi Garcia to envision the school year and begin building an integrated, connected, student-led middle school curriculum. Using the Understanding by Design (UbD) framework, Jaqi planned our first learning arc of the year by defining essential questions, milestones, assessments, and student-centered lessons. Armed with the essential question “How do belief systems influence the development and organization of culture?” our initial learning arc focused on ancient China. ‍The AltSchool Learning Cycle follows six stages aligned with what we know about how children learn best: Wonder; Engage; Investigate; Create; Share; Reflect. I also partnered with Jamie Stewart, Head of AltSchool Brooklyn Heights, and our Central Pedagogy Team (CPG), which consults across our network of lab and partner schools, to build professional development for our new educators focusing on UbD and project-based learning (PBL). When our new language arts, math, and science educators began onboarding in August, we walked them through the design phase of our integrated curriculum. 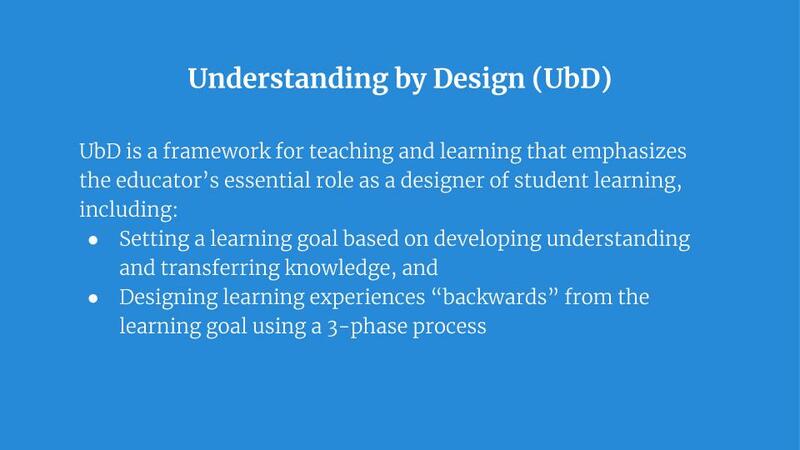 During this phase, we referred to UbD, best practices for PBL, and the AltSchool Learning Cycle. These educators then planned their first learning arcs, seeking connections with ancient China. We asked: Where do our milestones connect? How was math used in ancient civilizations? Why did people live where they lived in ancient China? We designed assessments and lessons to target learning toward those learning objectives. Our conversations were engaging and we were learning as a team. It was exciting to define essential questions that all educators could use to align their Units. Now we had to see how it worked with students. Read More: Milestones Matter: A Deeper Look at Measuring Learner Competency. When school started in August, I scheduled weekly curriculum meetings where educators could discuss what was working with students and align on how to modify our curriculum. As we progressed through the curriculum, students’ individual strengths, challenges, and motivations became evident. We discussed the types of assignments that excited and engaged students, and then shared the lessons in which we observed our students produce their best work. We then planned future lessons based on what we learned. Read more: The Power of Embedded Reflection by AltSchool educator Courtney Reynolds. In November, I worked with our CPG team to organize another UbD professional development day to plan our second learning arc. Earlier in the year, our educators learned how to plan with UbD and create connections between their curricula. During this round, we challenged ourselves to create even more intentional interdisciplinary connections. Anchoring on ancient India, educators designed connections between literature, the Ramayana (an ancient Indian story), and sounds and light from Indian culture. The unit also included trips to the Rubin Museum and our local library for research. As our educator team became more efficient at planning assignments and collaborating between colleagues, we also saw learners who were increasingly engaged: As they progressed through the arc, students designed and built instruments, composed music, and presented the unique histories of different ancient Indian cultures to their classmates for initial feedback, and then at a culminating learning exhibition for their families. Read more: My Learning Transcends the Classroom: Creating an Open-Walled Education. In February, educators from all of our lab schools were fortunate to have a week of professional development. The Union Square team used part of this time to plan for our third and final learning arc of the year, focused on ancient Greece and infectious diseases. Our CPG team scaffolded the week, while heads of school and personalization leads led sessions helping educators dig deeper into learning objectives within Milestones, explore assessment types to assess for particular comprehension, and co-design learning pathways with students. After this week, three educators continued to work on a weekly project co-designing learning pathways with students, and our final learning arc had been planned. Returning to the classroom, students chose their own content areas in humanities and STEM to research deeply, aligned those with the milestones they needed to work toward over the trimester, and in collaboration with educators, co-designed rubrics to assess their final learning products. Students wrote modern plays based on the Greek classics, created historical videos about the philosophers, and built models of Parthenon in real life and in Minecraft. They created graphs of the infectious diseases they studied using the statistics that they learned in math, graphed and analyzed public data sets, and then used that data to support the claims they made in their science research reports. To demonstrate what they had learned, students created podcasts, posters, and models of their learnings and shared their artifacts with the entire school community during our end-of-year learning exhibition. Throughout the year, scaffolded professional development enabled our educator team to deepen their student-centered practice. In each learning arc, educators strengthened their collaboration by co-planning their units with colleagues. This year at AltSchool Union Square, educators and students learned the value of revision, teamwork, and creativity. A key component of professional growth for educators is building agency around designing curricula and creating learning experiences that foster agency in their students. When students and educators operate as learners, this work becomes transparent. In just one school year, I'm so proud of the work that the Union Square team—including students and educators—has done to create a student-centered environment. With a firm foundation of community and academic curiosity, we are building the next generation of learners. Alex has 20 years of experience leading and teaching in independent schools in New York City. Prior to AltSchool, he worked at City and Country School as their director of middle and upper school.